GALAX GeForce GTX 1070 KATANA Review – The First Single-Slot GTX 1070! We have seen some very large GTX 1070 occupying almost three PCI slots; and we have also seen regular sized GTX 1070, as well as mini or compact sized GTX 1070. But this one is the first single-slot GTX 1070 in the market, and probably the only one in the market. Today, we are going to look at and review the GALAX GeForce GTX 1070 KATANA graphics card. If you haven’t been living under the rock, I’m sure you have encountered or at least heard of the GTX 1070 KATANA a few weeks or months ago. Probably you may have seen or read a lot of GTX 1070 reviews already. This one is quiet unique due to its size or slimness and limited cooling capability. So how does the Galax GTX 1070 KATANA performs? Can it compete with other full-sized GTX 1070s? Is this graphics card for you? Please continue reading our Galax GTX 1070 KATANA review below and find out. 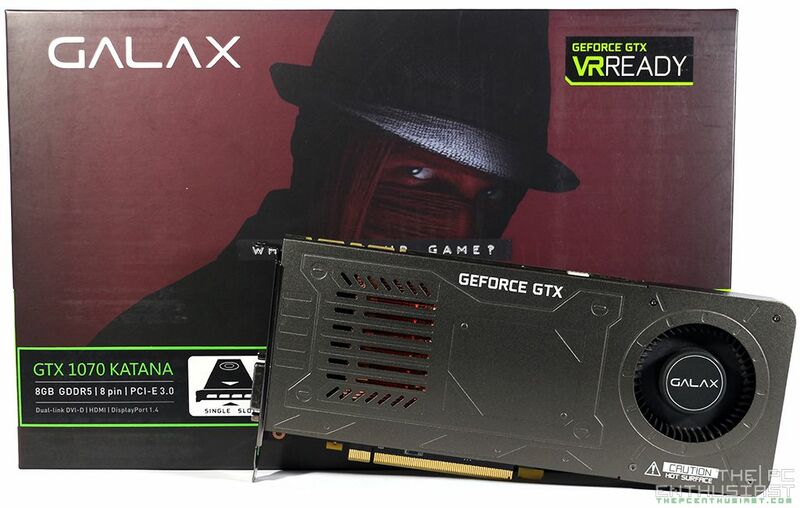 GALAX picked a pretty interesting name to depict or represent their single-slot GTX 1070 – the “KATANA”. According to WikiPedia, “the Katana is characterized by its distinctive appearance: a curved, single-edged blade with a circular or squared guard and long grip to accommodate two hands.” GALAX’s GeForce GTX 1070 is definitely slim compared to other GTX 1070s. It’s also “single-edged” (I’m referring to the PCIe fingers / pun intended); and it’s distinct in appearance mainly because it’s the only single-slot GTX 1070 in the market. The Galax GTX 1070 is definitely a niche graphics card, as not all will be a fan of its design. But for some users, enthusiasts or gamers who really need or want a single-slot graphics card that can actually drive games in 1080p or 1440p at ultra-settings; this graphics card would be an interesting option. Since it only occupies a single PCI slot, you could literally do a 2-way SLI with this card side by side occupying only two PCI slots; specially if the motherboard has two x16 PCIe slots situated closely. Examples of this kind of motherboard, where the PCIe slots are positioned right to each other, are the Asus X99-E WS and the ASRock X99 WS motherboards. Like all of the GTX 1070 in the market, the Galax GTX 1070 KATANA is powered with NVIDIA’s GP104 GPU featuring Pascal architecture. It still has 1920 CUDA cores, 15 streaming multiprocessors enabled, 120 TMUs, 64 ROPs and 6.45 TFLOPs of single-precision floating point performance. Basically, it’s just the same as any other GTX 1070 in the market but with a slimmer (and shorter) form factor, limited but different cooling solution, more or less fewer power phases used; and still performs like any other GTX 1070 in the market. But we’ll get into its performance and temperature in the later part of this review. The Galax GTX 1070 KATANA also features 8GB of GDDR5 memory; and has a tad higher clock speeds compared to the Founders Edition, at 1518 MHz base and 1708 MHz boost. It also features Simultaneous Multi-Projection, VR Ready, NVIDIA Ansel, NVIDIA G-Sync, NVIDIA GameStream, Vulkan and DirectX 12 (12_1) API support, NVIDIA SLI with the new High Bandwidth (HB) Bridge support and the new NVIDIA GPU Boost 3.0. It doesn’t have any RGB lighting or LED lighting, but it uses an all-copper fins, a copper base plate that directly touches the GPU die and a vapor chamber. GALAX calls this the RazorX Technique. The company claims that their RazorX Technique can maintain consistent performance even in thermally challenging scenario. We’ll find more about that as well in our temperature tests. Below is a side by side comparison of the Galax GTX 1070 KATANA and NVIDIA’s GeForce GTX 1070 Founders Edition specifications. Next page, we’ll take a closer look at the graphics card itself. AMD Ryzen 7 Processors Get Price Drops – Now Even More Affordable!